The family wants to go somewhere, kids; four legged and the fur-less kind, in goes the baby, and all of the associated gear, in bounds the over excited pup. And off we go, wait a minute, does anyone else see a problem here? Ok let’s take a step back, before the pup starts jumping all over the baby. We have taken the time to make sure that baby is safe in the car seat, but not the dog. If we make sure that the pup is safely contained, then that’s a win for the baby, and a win for the dog, and peace of mind for you. So this is not; tying the dog into the back of the car or having the dog in a harness on the back seat. At the very least having a barrier for behind the back seats, between the dog and the baby, has to be securely attached – I have heard of cases of them falling over during travel. 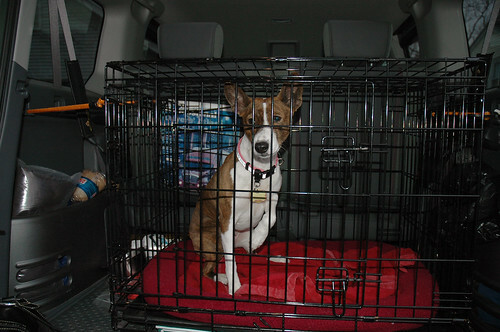 Even better is having the dog crated in the back (of a station wagon, or SUV) but if your lifestyle does not require a vehicle of this kind, then having your dog crated on the back seat, with a blanket or something that the dog is unable to see the child between them. Having a physical barrier between the dog and the child will eliminate the risk of the dog interacting with the baby whilst you are concentrating on the road, therefore increasing the safety of the baby and of the dog. It only takes 2 minutes to go and put the crate up in the car. Spending a few minutes in preparation, can increase safety immensely, and reduce stress levels. Your dog needs to be easy, we need to keep the dog in our lives, even though the family has grown and your time has decreased, thoughtful management of the dog will help keep him part of the family.